A breathtaking view, blue lake in the distance, tiny fields below, pristine white and blue jagged where mountains touch the sky. Let your lungs fill with pure, crisp mountain air and your heart with intense joy and anticipation. Let the boards slide. Go hard. The snow areas in the region are diverse and cater to all levels of snow experience. Start on gentle corduroy groomed hillocks and build towards steep challenging chutes, terrain parks, half pipes or untouched powder fields. Ride chair lifts, helicopters or snow cats to access the snow you want, or simply relax on sun soaked decks and watch the action. For a wilderness mountain experience, pack a picnic and safety gear and trek across ridges to find your own line on an untouched slope - pure bliss. 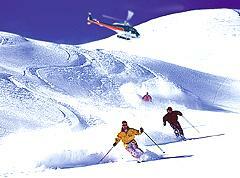 The Southern Lakes region enjoys an international reputation with its variety of world-class ski fields. Coronet Peak and The Remarkables, Cardrona and Treble Cone, each offers quality terrain to skiers. Waiorau Snow Farm is New Zealand's only Nordic and cross-country ski area. If heli-skiing is your thing then this is your domain - and the panoramic views from the mountains are stunning.